One of my favorite plays is Mary Chase's Harvey. For those who don't know, Harvey is the story of Elwood P. Dowd, a nice guy who can see a six foot three and a half white rabbit named Harvey. Elwood and Harvey become close friends which aggravates Elwood's socially up-and-coming sister Veta Louise. Veta decides to send Elwood to a sanitarium on the outskirts of town called Chumley's Rest. After your standard comedy of errors and mistaken identity, Veta, Dr. Sanderson and Dr. Chumley are all on the lookout for Elwood and Harvey. I was first brought to the attention of Harvey when my cousin played Dr. Sanderson in a high school production. Afterwards, I watched the 1950 James Stewart movie and the 1999 Harry Anderson TV movie which are both just phenomenal. I highly recommend the Jimmy Stewart version but I'm a big fan of Harry Anderson so it's always my go-to. But that first high school production got me on board. Yesterday, the high school I work at, the same high school mentioned above actually, did another production so I decided to go and watch it. Aside from some sound issues and that it seemed to take most of the cast some time to really find their footing, it was just as I remember it. I love the nuances of Elwood that are sprinkled about the play--mostly his annoying cheerfulness and him always giving his card to people and explaining which phone number they may reach him at--but the character of Veta is much more a daunting task to play because the actress has to not only not believe in Harvey but also believe in him. 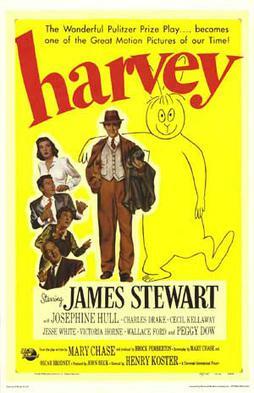 When Jimmy Stewart didn't win the Oscar for his portrayal but Josephine Hull did for Veta, Stewart praised Hull saying that all he did was believe Harvey was real. Hull had to both believe and not believe. If you get a chance to ever watch Harvey--it's on occassionally during TCM's 31 Days of Oscar--I highly recommend it. It's an excellent, slightly over-the-top, feel-good story. Why did it take Gladys an hour to realize that Wilberforce never went to bed? I love the look of utter disdain on Wilberforce's face in the second panel. That is the face of a kid who has nothing left to care about. Or one half of the Menendez brothers. The one on the right clearly.